While there’s still time to ship before the holidays, I’ll be bumping up some of my favorite smaller, unsold works that would be wonderful holiday gifts for that special someone. Give the gift of art — a celebration of beauty and creative inspiration. Purchase two and receive free shipping! 3×3″, Golden OPEN Acrylics on stretched canvas. 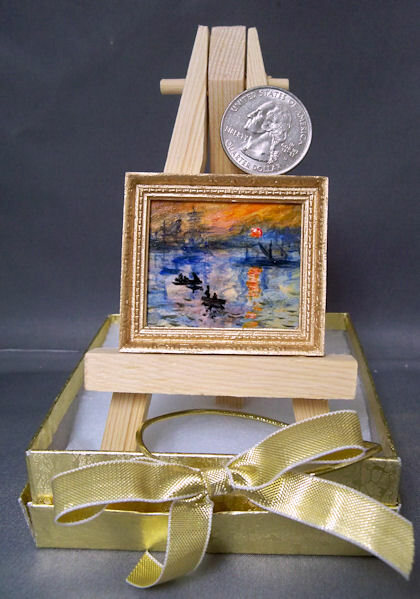 Easel, gold gift box and ribbon included. Some time ago, there was a fantastic rainbow over the lake just before sunset. I grabbed my camera and ran outside to get some photo references. This was painted from one of the photos I took. The light and colors were almost too amazing to believe. This miniature is shipped in a gold gift box, with a gold bow. The easel is included too! It makes the ideal present for any art lover, and looks great set on a small table or shelf. Quarter is shown for size reference. 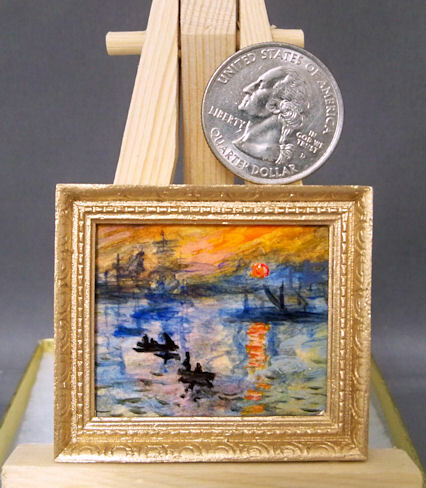 These tiny copies of works by famous painters tend to get done on a commission basis, so if you’ve got a favorite you’d like done that is now within the public domain, let me know. 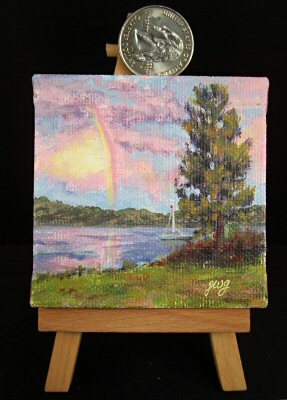 They are sold framed and with a small easel stand, and come in a tiny gold gift box with ribbon. Every once in awhile, I forget to post a painting. Sometimes I don’t realize until years later, when somebody requests a painting of a certain subject. 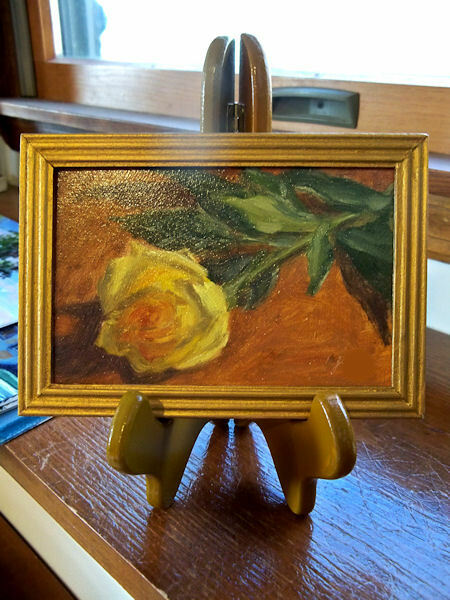 In this case, I was asked if I had a painting of yellow roses. In searching through all my yellow rose paintings (and believe me, I had no idea I’d done so many! ), I came across this one, which never got posted to my blog. This ended up being the chosen painting. I’m sorry about the glare in the photo. (It’s a good thing I’m a painter and not a photographer!) This one’s off to a new home tomorrow, but there are more yellow rose paintings floating around the studio if anybody else is interested! Remember, there’s still time left to get that special someone a beautifully framed 5×7″ painting at a Holiday Special price with free shipping! Many still available. Click here to see them and for details.